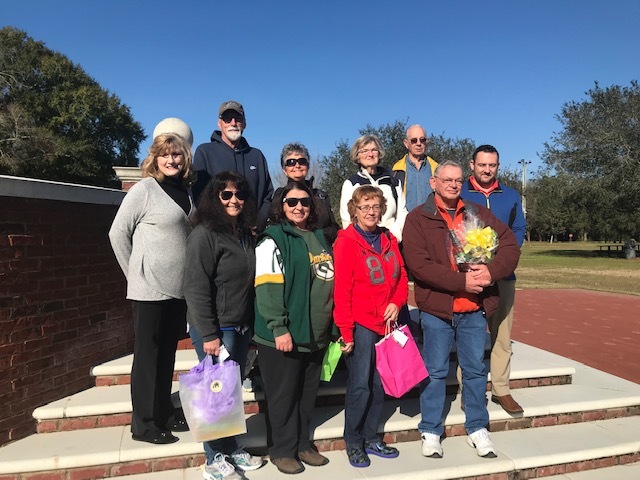 Several winter visitors were awarded prizes for participating in the “Find It in Foley” treasure hunt, held in conjunction with the 8th annual Visit Foley Coffee held on Jan. 8. The coffee is hosted on the second Tuesday in January by the city of Foley and the South Baldwin Chamber of Commerce to welcome winter guests and provide information about things to see and do in Foley and nearby areas. Prizes, including two Amazon Fire HD 10 tablets, a gift certificate for condo rental, gift baskets, gift certificates and other items donated by local merchants, were awarded from a drawing of those who took time to visit points of interest that included shops and restaurants in downtown Foley. Merchants and organizations who supplied a gift certificate or prizes for the event included: Southern Chevrolet, Piggly Wiggly, Streets of Orleans, Book Exchange, Warrior Fit, Path to Wellness, Clara’s Loom, Yabba’s Wacky Snack Shack, Doc Holiday’s, Kaley Yeah, the Foley Art Center, South Baldwin Regional Medical Center, Brett/Robinson, Copper Kettle Tea Bar, and the Foley Welcome Center. Visitors who attended the coffee received welcome bags that contain discount coupons and information from area businesses. Welcome bags will continue to be distributed at the Foley Welcome Center as long as supplies last. Photo Caption: Pictured from Left to right Front Row are Beverly Manley, Event Coordinator, City of Foley; Hawley Goodell of Bernhards Bay, New York; Sandy Evans of Gastonia, North Carolina; Mary Brown of Livingston, Texas; Ron Little of McLeansboro, Illinois; Travis Valentine of South Baldwin Chamber of Commerce; Second Row: Lisa Wydeven of Kaukauna, Wisconsin; Ann Werner of Wisconsin; Kathy Johnson of DeWitt, Michigan; Jim Hoult of Chrisman, Illinois.